Arjun Reddy is a 2017 Indian Telugu-language drama film written and directed by Sandeep Vanga, and produced by his brother Pranay Reddy Vanga's company Bhadrakali Pictures. It stars Vijay Deverakonda and Shalini Pandey in the lead roles, and Rahul Ramakrishna, Jia Sharma, Sanjay Swaroop, Gopinath Bhat, Kamal Kamaraju and Kanchana in supporting roles. The film tells the story of Arjun Reddy Deshmukh (Deverakonda), a high-functioning alcoholic surgeon who has anger management problems. Arjun is on a self-destructive path after the marriage of his girlfriend Preethi Shetty (Pandey); the film focuses on his downfall and subsequent resurgence. Arjun Reddy was partially inspired by Vanga's life as a physiotherapy student. He worked on the script for two years and it took four to five years for the film to materialise. Principal photography commenced on 20 June 2016 at Hyderabad and took 86 working days to complete. Other filming locations include Mangalore, Dehradun and New Delhi; filming also took place in Italy. Radhan and Harshvardhan Rameshwar composed the soundtrack and score, respectively. Raju Thota was director of photography and Shashank Mali edited the film. The film was made on a budget of ₹40—51.5 million; it was released worldwide on 25 August 2017 after receiving an 'A' (adult) certification from India's Central Board of Film Certification. Post-release, the film received positive reviews for its direction, writing, cinematography and the cast's performances—especially that of Deverakonda. It drew criticism for allegedly promoting substance abuse among young people and for its romantic scenes. The film was a box office success, grossing ₹510 million globally, with a distributor share of ₹260 million. It went on to receive six nominations at the 65th Filmfare Awards South, including Best Telugu Film, Best Telugu Director for Sandeep Vanga and Best Telugu Actor for Deverakonda, the film's only win at the ceremony. It is being remade in Tamil as Adithya Varma and in Hindi as Kabir Singh. Arjun Reddy Deshmukh is a final-year student at St. Mary's Medical College in Mangalore, India. He is one of its house surgeons who, despite being a brilliant student, has severe anger management problems that earn the wrath of the dean of the college. Arjun's aggressive nature also earns him a reputation among his juniors as a college bully. After having a brawl alongside his friend Kamal against members of the opposing team during an inter-college football match, the dean asks Arjun to either apologise or leave the college. Arjun initially chooses the latter but stays back after meeting first-year student Preethi Shetty. Arjun and his friend Shiva enter a first-year classroom and announce that Arjun is in love with Preethi and asserts that she is exclusive to him. Initially afraid, Preethi starts adjusting herself to Arjun's overbearing attitude. She eventually reciprocates his feelings and they develop an intimate relationship. Arjun graduates with an MBBS degree and leaves for Mussoorie to pursue a Master's degree in Orthopedic surgery. Over the course of three years, Arjun's and Preethi's relationship becomes stronger. Months later, Arjun visits Preethi's house, where her father sees them kissing and throws Arjun out. Preethi's father opposes her and Arjun's relationship because they belong to different castes. Arjun demands that Preethi must make a decision within six hours otherwise he will end their relationship. Following this incident, Preethi's parents seize her telephone, making her unable to contact Arjun. By the time she manages to visit Arjun's house, he is drunk, injects morphine into himself, and becomes unconscious for two days. Preethi is then forcibly married to someone from her caste. Arjun learns about the marriage from Shiva and goes to her house in protest. He is assaulted and gets arrested for making a scene. Arjun's father ostracises him from the family home for damaging his reputation. With Shiva's help, Arjun finds a rented apartment and joins a private hospital as a surgeon. To cope with his emotions, he starts taking drugs, attempts one-night stands, and drinks alcohol; all of which are unsuccessful. Within months, he becomes a successful surgeon and a high-functioning alcoholic who is feared by the hospital's staff members. Arjun's self-destructing behaviour and refusal to move on worries Shiva and Kamal. He persuades one of his patients, Jia Sharma, a leading film star, to have a no-strings relationship with him, which he ends when she falls in love with him. On a day off, Arjun unwillingly agrees to perform a life-saving surgery and collapses with dehydration. The hospital staff examine his blood samples, which show traces of alcohol and cocaine. The hospital chief files a case against Arjun, who accepts the truth on the grounds of violating his professional ethics. Arjun's medical license is temporarily cancelled, and he is evicted from the flat. The next morning, Arjun learns that his grandmother has died; he meets his father, and they reconcile. Arjun gives up his self-destructive habits soon after. While on vacation, Arjun sees a pregnant Preethi sitting in a park. Convinced that she is unhappy with her marriage, Arjun meets her after returning from his holiday. Preethi reveals that she left her husband days after their marriage and continued to work in a clinic. She tells Arjun that he is the child's father, and they reunite. The pair marries, and Preethi's father apologises for misunderstanding their love for each other. Love stories are generally plot-driven, here it is driven by the character Arjun Reddy. It is a powerful name. During college years, you get to hear seniors talk about a legendary character and that name has a recall value. These days our Telugu film titles are lengthy and are from lyrics. I didn’t want that. Arjun Reddy was thought to be a faction film. I am juxtaposing that connotation with a love story. —Vanga on the film's title, in an interview with The Hindu in September 2016. After discontinuing his studies as a physiotherapist, Sandeep Vanga worked in the 2010 Telugu film Kedi as an assistant director. He worked on the script of Arjun Reddy for two years and for four to five years approached producers who were not willing to finance the project until Vanga's brother Pranay Reddy agreed to do so. Pranay and Vanga's father invested in the film equally. The project was made under the production banner of Bhadrakali Pictures. Arjun Reddy was partially inspired from Vanga's life as a physiotherapy student: "It is not my story but there are a lot of references from my life [...] Some of my medical college friends saw the film and said that Arjun reminds them of me." After working on a scene, he used to wait for a week as he believed that for a film with twists and turns, the narrative would have a chance to jump, thereby giving scope for cinematic liberties. For the same, whenever the idea for a plot twist came to him, Vanga used to work on it for three to four weeks. In a September 2017 interview with Sangeetha Devi Dundoo of The Hindu, Vanga said he believed that Telugu cinema uses dialects spoken in Guntur and Vijayawada. Since he was unaware of the way of speaking in both the places, he wrote the dialogue in a Hyderabad Telangana accent. He made use of words that were rarely spoken in colloquial Telugu like yaralu (sister in law) to make Arjun look "real and rooted". Some of the dialogue was written in Tulu. With a dark mood prevailing for 100 minutes, Vanga wanted a happy ending for the film, with two or three options for the climax. He said he "didn’t have the heart" to end the narrative on a sad note, considering the darkness Arjun was subjected to. The initial edit was 220 minutes long; this was reduced to 186 minutes. Vanga initially approached Sharwanand to play the film's lead role. Sharwanand was at first apprehensive of Vanga handling the responsibilities of directing and producing the project but after reading the script, he changed his mind. He sent the script to many producers, who considered the project too risky to fund. After Sharwanand left the project, Vanga signed Vijay Deverakonda to play Arjun Reddy. Deverakonda's breakthrough film Pelli Choopulu (2016) hand not yet been released, and many were against Vanga for casting him, citing it a risky move for a home production. In an interview with Indo Asian News Service, Devarakonda called the portrayal of Arjun Reddy exhausting, noting that, "I had to be constantly probing into the darkest areas of my consciousness, digging out feelings and tapping into emotions I had never touched in myself". He did not have any cinematic references but watched films like The Godfather (1972), Scarface (1983) and Goodfellas (1990) to remain in an alpha male zone. Arjun and Preethi had an age difference of four years, which Vanga wanted to showcase effectively. He chose Shalini Pandey to play Preethi; she was pursuing a career in theatre in Jabalpur. Pandey's father was apprehensive of her signing a film contract; the shoot delayed by five months. Pandey was firm in her decision, which strained her relationship with her father. Vanga wanted her to dub for her role, to which she agreed because it would help her own the character completely. Vanga conducted an eight-day acting workshop with Deverakonda and Pandey. Kanchana was cast as Arjun's grandmother in November 2016; Arjun Reddy marked her comeback to Telugu cinema after Shri Datta Darshanam (1985). The producers persuaded her to join the project after a long series of discussions. Rahul Ramakrishna, who worked as a lyricist for Pelli Choopulu, was cast as Arjun's friend Shiva. Ramakrishna's career as a journalist helped him understand several dialects, which in turn had a positive effect on his performance. He called Shiva's friendship with Arjun "loyal and unconditional", which gives them the liberty to deride each other at times. Amit Sharma was chosen after a three-hour audition; Vanga felt he "had the apt attitude and arrogance" for the role of Amit, Arjun's nemesis. Bhushan Kalyan played the role of the college's dean. Tulu actor Gopinath Bhat was cast as Preethi's father. Sanjay Swaroop, Kamal Kamaraju, Jia Sharma and Priyadarshi Pullikonda were cast in other important roles. Nagesh Banell was initially the film's director of photography. He was replaced by Raju Thota later, who worked for 85% of the film. Deverakonda recommended him; he did the clash work for Pelli Choopulu whose cinematography was handled by Banell. [b] Vanga worked on the film's sound design and worked with Sachin Hariharan of Sync Cinema. Harshavardhan Rameshwar composed the background score. Shashank Mali edited the film. The film's principal photography commenced at Hyderabad on 20 June 2016. Kanchana joined the film's sets on 30 November 2016. The protagonists' college life portions were filmed at the three heritage buildings of the University college of Hampankatta, Mangalore. Other filming locations included Dehradun and Delhi in India and parts of Italy. According to Deverakonda, Vanga wanted to set the film in a coastal city and chose Mangalore—mirroring his student life in Dharwad—and stayed there for ten days to finalise the locations. In an interview with Idlebrain.com, Vanga said, "When you write a script, you think about a particular location. But, it scared me when we got worst of locations for some of the scenes. But it didn’t matter because our attention would be on characters. I realised that when content is clear, locations doesn’t matter most of the times." The principal photography was completed in 86 working days, and was made on a budget of ₹40—51.5 million. [a] Vanga preferred long, uninterrupted takes; the pre-Intermission sequence was seven minutes long. According to Deverakonda, if filmed in conventional style, Vanga would have finished the film in 200 working days. For a few scenes, Thota used a hand-held camera weighing 25 kilograms (55 lb), which adversely affected his hands. The classroom fight scene featuring Deverakonda, Pandey and Sharma was filmed in a single take; Sharma wanted Deverakonda to actually hit him to make the scene look natural. He said their experience in theatre helped their performances. The crew wanted to film the intermission scene, in which Arjun urinates in his pants, authentically but a delay in the shoot led to the insertion of a medical hosepipe in Deverakonda's trousers. 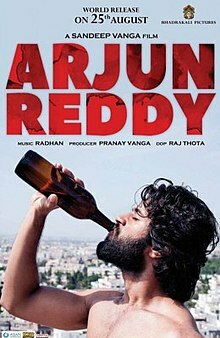 The soundtrack of Arjun Reddy consists of seven songs, all of which were composed by Radhan. Ananta Sriram, Rambabu Gosala and Shreshta wrote the lyrics of two songs each while Mandela Pedaswamy was the lyricist of "Mari Mari". Shreshta wrote the lyrics for "Madhurame" and "Gundelona"; she composed the latter's tune, which lacked instrumental support. "Gundelona" is the debut of Sowjanya as a playback singer. As a part of the film's marketing, the first single from the soundtrack, titled "Mangaluru – Mussorie" (later known as "Dhooram") was released on 30 April 2017. Three more singles— "The Breakup Song" (later known as "Teliseney Na Nuvvey"), "Emitemito" and "Madhurame"—were released on 19 May, 9 and 23 June 2017, respectively. Srivathsan Nadadhur, writing for The Hindu, said "The Breakup song", along with "Break-Up" from Rarandoi Veduka Chudham (2017) and "Badulu Cheppave" from Ninnu Kori (2017) is an instance in which Telugu cinema "continued in Kolaveri mode too intermittently" in the first half of 2017. The film's soundtrack was marketed by Aditya Music and was released at a pre-release promotional event in Hyderabad on 21 August 2017. The film's music received a positive response from critics. Sangeetha Devi Dundoo of The Hindu wrote that Radhan's music, which varies from "classical strains to more trippy beats", was one of the factors, along with the cinematography, that brought Arjun Reddy to life. Neeshita Nyayapati writing for The Times of India said the songs "deserve a special mention" and that Radhan did a "brilliant job". Namrata Suri of The News Minute wrote that Arjun Reddy has one of the "most original soundtracks composed by Radhan", and that "Madhurame" and "The Breakup song" are the memorable songs from the film. In December 2017, Nadadhur commented; "For a film so brutally raw and honest, Arjun Reddy got its aura from its music as much as the swag of Vijay Deverakonda". He added that the heavy metal undertone matched up to the "extremities and mood swings of its lead character". Nadadhur also praised the use of semi-classical and jazzy touches in the soundtrack. Arjun Reddy was awarded an 'A' (adult) certificate by the Central Board of Film Certification due to the abundance of expletives and innuendoes. Vanga complained that the board took his creative struggle for granted. He considered writing a letter to the board asking what was taken into consideration before certification. The board complained that the producers of the film had not submitted their promotional material for censoring before using it. Asian Cinemas and KFC Entertainments acquired the film's distribution rights for Telangana and Andhra Pradesh. Nirvana Cinemas distributed the film in overseas markets. Days before the film's release, Indian National Congress party's Rajya Sabha member V. Hanumantha Rao tore promotional posters featuring the lead pair kissing each other that had been pasted on TSRTC buses. He found them objectionable and said they adversely affected the minds of young people. It led the film's promoters to remove such posters across Telangana and Andhra Pradesh. Arjun Reddy was released worldwide on 25 August 2017, notably clashing with Indian films Vivegam and A Gentleman. In Hyderabad, 55 paid premieres were held a day before the release, surpassing the record set by Baahubali 2: The Conclusion which had 33 premiere shows. Post-release, Hanumantha Rao lodged a complaint against the film, stating that it promoted sexual abuse in colleges and substance abuse in hospitals. He also asked Kalvakuntla Chandrashekhar Rao, the chief minister of Telangana, to stop the film's screening across the state. A week after the film's release, D. Nagaraju from Khammam accused the film's makers of plagiarising his script and demanded compensation of ₹20 million. In Vijayawada, women's organisations held a protest against the film, complaining of its "objectionable" content that could have a negative impact on young people. Arjun Reddy's digital rights were acquired by Amazon Prime, which made it available online on the 50th day of theatrical release. Star Maa purchased the satellite rights for ₹35 million. The film had its global television premiere on 21 January 2018, with a TRP rating of 13.6. The film was substantially edited for in its television premiere, drawing criticism from its audience. Arjun Reddy opened to a 100% occupancy in some areas of India, including districts of Telangana and Andhra Pradesh. At the United States box office, the film debuted with earnings of US$194,051 from its premieres and of US$709,347 in two days. By the end of its first weekend, it grossed US$954,677 in the US, and A$111,521 in Australia. Arjun Reddy grossed ₹189.8 million globally, with a distributor share of ₹104.2 million in its first weekend. The film was declared commercially successful as it earned a profit of 73.66% for its distributors. Arjun Reddy's earnings exceeded US$1 million on its fourth day of theatrical release in the US, becoming the 32nd Indian Telugu-language film to do so. By the end of its first week, the film grossed ₹343 million and a distributor share of ₹185 million, providing a return of nearly 200% to its distributors. After earning US$1,681,996 in 17 days in the US, Arjun Reddy became the fourth highest grossing Telugu film of the year in that country. By then, it had grossed a worldwide total of ₹450 million and a distributor share of ₹250 million. In its complete global theatrical run, Arjun Reddy grossed a total of ₹510 million and earned a distributor share of ₹260 million. Arjun Reddy received positive reviews from critics. Writing for Film Companion, Baradwaj Rangan said that while the pre-interval sequences were generic, the "prickly" latter portions justified both the film's title and the running time. Rangan called Arjun Reddy a film that "digs deep [and] rings true" and said it "really comes into its own" in the second half. S. Shiva Kumar of The Hindu wrote that Vanga's storytelling had a "conviction and confidence probably only a debutante will have". He found the performances, especially those of Deverakonda and Kanchana, "pitch perfect". Sangeetha Devi Dundoo said the film is "too raw and real to be absolutely fictional" and commented: "Hours after watching Arjun Reddy, it’s hard to shake off its effect. It’s like a hangover, albeit in a good way." Indo-Asian News Service gave the film five stars out of five, called it the "most original, experimental and daring work to come out Telugu cinema in a long time", and said the protagonist's "rise, fall and rise ... is nothing short of poetic and heart wrenching". Neeshita Nyayapati gave the film four stars out of five and commented: "With Arjun Reddy, Sandeep Vanga has managed to tell a story that is seldom told, without sleaze or cheesy lines or [over the top] drama". Srivatsan of India Today also gave the film four stars out of five and wrote: "Lo and behold, Arjun Reddy—the film and Vijay Deverakonda, is something that the Telugu industry deserved in the first place", and praised the "brutal and honest" filmmaking. Suresh Kavirayani of Deccan Chronicle also gave the film four stars out of five and commended the performances and the filmmaking but was apprehensive of the second half's pace. Hemanth Kumar, in his review for Firstpost, gave 3.75 stars out of five and praised the storytelling in particular, saying: "There are no gimmicks, no surprises, no twists. And in doing so, we are forced to absorb the film at a more personal and subconscious level." Latha Srinivasan, in her review for NewsX, wrote that the protagonist is "unconventional, free-spirited and tries to break the shackles of traditional societal norms". She said the romance is "rooted in deep emotions" and gave the film 3.5 stars out of five. Giving three stars out of five, K. Naresh Kumar of The Hans India was critical of the film's pace and a few subplots in the second half. He wrote: "As a tale of a love-struck man, who falters and finally figures out what is best for him, the experiment that the director undertakes is tedious, stretching out time and again". Murali Krishna CH, in his review for the Cinema Express, praised the unpredictability of the first half but was apprehensive of some emotional scenes in the second half; he found them a "serious flaw" after the intermission. Sowmya Rajendran, in her review for The News Minute, called Arjun Reddy a "great example of immersive storytelling" with a "blistering" performance from Deverakonda. She had problems with Preethi's lack of agency and her portrayal of an abusive relationship. She wrote: "What the happy ending does, however, is to validate Arjun's abusive behaviour towards Preethi, right from the time he set his eyes on her". Vishnupriya Bhandaram, writing for Firstpost, said Arjun Reddy is similar to Mani Ratnam's Kaatru Veliyidai (2017) in its portrayal of an abusive relationship, writing: "Stripped off [sic] the cinematography, style and treatment, Arjun Reddy isn’t that revolutionary after all, it is still a nod to the male ego". Arjun Reddy is being remade in Tamil as Adithya Varma, which marks the cinematic debut of Vikram's son Dhruv, who is reprising the role of Deverakonda. The Hindi remake Kabir Singh, which stars Shahid Kapoor and Kiara Advani, began filming in October 2018, and is scheduled to be released on 21 June 2019. ^ a b Jayakrishnan of The Times of India estimates the film's budget as ₹40 million, whereas Sangeetha Devi Dundoo of The Hindu says that ₹51.5 million was spent to produce the film. ^ Clash work is a practice of hiring a junior cinematographer when a film's director of photography handles other commitments simultaneously and is unavailable for the principal photography. ^ a b c d e f Nathan, Archana (29 August 2017). "'Producers told me to forget this story:' Fortunately, the director of 'Arjun Reddy' ignored them". Scroll.in. Archived from the original on 2 April 2018. Retrieved 2 April 2018. ^ Jayakrishnan (10 September 2017). "Arjun Reddy box office collection week 2: Vijay Devarakonda starrer collects Rs 41.5 crore worldwide". The Times of India. Archived from the original on 2 April 2018. Retrieved 2 April 2018. ^ a b c Dundoo, Sangeetha Devi (9 September 2017). "Three hours and a huge hit later". The Hindu. Archived from the original on 2 April 2018. Retrieved 2 April 2018. ^ a b "Telugu film 'Arjun Reddy' reaches the Rs 50 crore club". The News Minute. 16 October 2017. Archived from the original on 6 February 2018. Retrieved 6 February 2018. ^ a b Sunita Chowdary, Y. (27 September 2016). "Breakups and after". The Hindu. Archived from the original on 2 April 2018. Retrieved 2 April 2018. ^ a b c d e f g h i "Interview with Sandeep Reddy Vanga about Arjun Reddy". Idlebrain.com. 24 August 2017. Archived from the original on 2 April 2018. Retrieved 2 April 2018. ^ a b Kavirayani, Suresh (15 May 2016). "Vijay as Arjun Reddy". Deccan Chronicle. Archived from the original on 2 April 2018. Retrieved 2 April 2018. ^ a b Dundoo, Sangeetha Devi (30 August 2017). "'Fearless in front of the camera'". The Hindu. Archived from the original on 3 April 2018. Retrieved 3 April 2018. ^ a b "This Telugu film will have dialogues in Tulu". The Hans India. Indo-Asian News Service. 14 June 2016. Archived from the original on 3 April 2018. Retrieved 3 April 2018. ^ Tanmayi, Bhawana (1 October 2017). "When Mahanubhavudu talks about obsessions". Telangana Today. Archived from the original on 2 April 2018. Retrieved 2 April 2018. ^ Jonnalagedda, Pranita (17 August 2017). "Director Sandeep Vanga to watch out for!". Deccan Chronicle. Archived from the original on 2 April 2018. Retrieved 2 April 2018. ^ K Jha, Subhash (19 December 2017). "'Arjun Reddy' exhausted the hell out of me: Vijay Deverakonda interview". The News Minute. Indo Asian News Service. Archived from the original on 2 April 2018. Retrieved 2 April 2018. ^ Murali Krishna, CH (30 August 2017). "I'm open to a live-in relationship: Arjun Reddy star Shalini Pandey". The New Indian Express. Archived from the original on 2 April 2018. Retrieved 2 April 2018. ^ Jonnalagedda, Pranita (12 August 2017). "Shalini Pandey: Driven by passion". Deccan Chronicle. Archived from the original on 2 April 2018. Retrieved 2 April 2018. ^ a b "Veteran actor Kanchana set for comeback in Vijay Deverakonda's Arjun Reddy". Hindustan Times. Indo Asian News Service. 29 November 2016. Archived from the original on 3 April 2018. Retrieved 3 April 2018. ^ Ranjith, Gabbeta (22 September 2017). "My role as Shiva in Arjun Reddy is the usual me: Rahul Ramakrishna". Telangana Today. Archived from the original on 2 April 2018. Retrieved 2 April 2018. ^ Sunita Chowdary, Y (29 August 2017). "Redefining friendship". The Hindu. Archived from the original on 2 April 2018. Retrieved 2 April 2018. ^ a b Watson, Shweta (12 September 2017). "I asked Vijay to really punch me: Amit Sharma". Deccan Chronicle. Archived from the original on 3 April 2018. Retrieved 3 April 2018. ^ Sunita Chowdary, Y (28 March 2017). "Bhushan Kalyan: In a creative space". The Hindu. Archived from the original on 3 April 2018. Retrieved 3 April 2018. ^ "'Arjun Reddy' Kannada remake to star Yash?". The News Minute. 13 September 2017. Archived from the original on 3 April 2018. Retrieved 3 April 2018. ^ "First Look: Vijay Devarakonda as Arjun Reddy". Sify. 12 May 2016. Archived from the original on 4 April 2018. Retrieved 4 April 2018. ^ a b c Kavirayani, Suresh (6 September 2017). "Tollywood's got a new cameraman". Deccan Chronicle. Archived from the original on 4 April 2018. Retrieved 4 April 2018. ^ Nadadhur, Srivatsan (12 October 2016). "An eye on the lens: Nagesh Banell". The Hindu. Archived from the original on 4 April 2018. Retrieved 4 April 2018. ^ a b Kumar, Hemanth (3 September 2017). "Vijay Deverakonda: Arjun Reddy gave me the confidence to speak my mind". Firstpost. Archived from the original on 2 April 2018. Retrieved 2 April 2018. ^ "'Arjun Reddy' TV premiere leaves fans disappointed". The News Minute. 3 February 2018. Archived from the original on 4 April 2018. Retrieved 4 April 2018. ^ "Vijay Deverakonda turns surgeon". The Hindu. Indo Asian News Service. 14 June 2016. Archived from the original on 2 April 2018. Retrieved 2 April 2018. ^ Kampila, Raviprasad (4 November 2017). "Mangaluru's heritage buildings now a destination for moviemakers". The Hindu. Archived from the original on 2 April 2018. Retrieved 2 April 2018. ^ Madhu, Daithota (15 September 2017). "'I lied that I was a Tuluva in college to escape from being made fun of for not speaking fluent Telugu'". The Times of India. Archived from the original on 3 April 2018. Retrieved 3 April 2018. ^ K Jha, Subhash (31 August 2017). "A lot of grey areas in my personality: Vijay Deverakonda". Deccan Chronicle. Archived from the original on 5 April 2018. Retrieved 5 April 2018. ^ a b "Arjun Reddy". Raaga.com. Archived from the original on 31 January 2018. Retrieved 31 January 2018. ^ Dundoo, Sangeetha Devi (7 September 2017). "Songwriter chronicles". The Hindu. Archived from the original on 2 February 2018. Retrieved 2 February 2018. ^ Tanmayi, Bhawana (21 October 2017). "Lyricist Shreshta is all set to work with biggies of the industry". Telangana Today. Archived from the original on 2 February 2018. Retrieved 2 February 2018. ^ "Mangaluru – Mussoorie (From "Arjun Reddy") – Single". iTunes. 30 April 2017. Archived from the original on 2 February 2018. Retrieved 2 February 2018. ^ "The Breakup Song (From "Arjun Reddy") – Single". iTunes. 19 May 2017. Archived from the original on 2 February 2018. Retrieved 2 February 2018. ^ "Emitemitemito (From "Arjun Reddy") – Single". iTunes. 9 June 2017. Archived from the original on 2 February 2018. Retrieved 2 February 2018. ^ "Madhuram (From "Arjun Reddy") – Single". iTunes. 23 June 2017. Archived from the original on 2 February 2018. Retrieved 2 February 2018. ^ Nadadhur, Srivathsan (29 June 2017). "Music in Telugu films: Some sunshine amid rain". The Hindu. Archived from the original on 3 February 2018. Retrieved 3 February 2018. ^ Arjun Reddy Pre Release Event (Event). India: Aditya Music. 21 August 2017. ^ a b Dundoo, Sangeetha Devi (26 August 2017). "Arjun Reddy movie review: A landmark film". The Hindu. Archived from the original on 26 January 2018. Retrieved 26 January 2018. ^ a b Nyayapati, Neeshitha (26 August 2017). "Arjun Reddy Movie Review". The Times of India. Archived from the original on 26 January 2018. Retrieved 26 January 2018. ^ Suri, Namrata (28 December 2017). "A year of change: The best of Telugu cinema in 2017". The News Minute. Archived from the original on 3 February 2018. Retrieved 3 February 2018. ^ Nadadhur, Srivathsan (27 December 2017). "Telugu film music in 2017: This sounds right!". The Hindu. Archived from the original on 3 February 2018. Retrieved 3 February 2018. ^ "Shocking duration for Arjun Reddy". The Hans India. 12 August 2017. Archived from the original on 2 April 2018. Retrieved 18 September 2018. ^ Jayakrishnan (18 August 2017). "Arjun Reddy gets A certificate". The Times of India. Archived from the original on 8 April 2018. Retrieved 8 April 2018. ^ a b Murali Krishna, CH (24 August 2017). "Arjun Reddy being compared to Baahubali 2". The New Indian Express. Archived from the original on 8 April 2018. Retrieved 8 April 2018. ^ Tanmayi, Bhawana (26 July 2017). "Arjun Reddy gears up for release". Telangana Today. Archived from the original on 8 April 2018. Retrieved 8 April 2018. ^ "Arjun Reddy Box Office Collection: Vijay Devarakonda's film makes a strong show at international market". Business Today. 3 September 2017. Archived from the original on 8 April 2018. Retrieved 8 April 2018. ^ Paul, Papri (21 August 2017). "Hanumanth Rao tears down 'Arjun Reddy' poster while Vijay Deverakonda asks him to chill". The Times of India. Archived from the original on 8 April 2018. Retrieved 8 April 2018. ^ H Hooli, Shekhar (23 August 2017). "Arjun Reddy kissing poster removed: Makers offer apology for using controversial photo". International Business Times. India. Archived from the original on 8 April 2018. Retrieved 8 April 2018. ^ "Vivegam, Arjun Reddy rule Friday box office collections; A Gentleman has Rs 4 crore opening". Firstpost. 26 August 2017. Archived from the original on 8 April 2018. Retrieved 8 April 2018. ^ "Ban 'Arjun Reddy' for promoting drugs, says Congress leader who tore posters of the film". The News Minute. 30 August 2017. Archived from the original on 8 April 2018. Retrieved 8 April 2018. ^ Paul, Papri (31 August 2017). "'Arjun Reddy' gets embroiled in plagiarism controversy". The Times of India. Archived from the original on 8 April 2018. Retrieved 8 April 2018. ^ "Women's groups protest against 'Arjun Reddy' in Vijayawada, demand ban on film's screening". The News Minute. 1 September 2017. Archived from the original on 8 April 2018. Retrieved 8 April 2018. ^ Nadadhur, Srivatsan (26 December 2017). "Telugu films in 2017: The prime debate". The Hindu. Archived from the original on 9 April 2018. Retrieved 9 April 2018. ^ H Hooli, Shekhar (1 February 2018). "Arjun Reddy registers superb TRPs: Vijay's movie shatters the record of Mahesh Babu's Spyder". International Business Times India. Archived from the original on 9 April 2018. Retrieved 9 April 2018. ^ Tanmayi, Bhawana (22 January 2018). "Maa TV makes Arjun Reddy appear like a saint". Telangana Today. Archived from the original on 9 April 2018. Retrieved 9 April 2018. ^ H Hooli, Shekhar (25 August 2017). "Arjun Reddy box office collection day 1: Vijay's film creates history in US, starts with a bang in India". International Business Times India. Archived from the original on 6 February 2018. Retrieved 6 February 2018. ^ H Hooli, Shekhar (27 August 2017). "Arjun Reddy vs Vivegam US box office collection: Vijay's film beats Ajith's movie with a big margin". International Business Times India. Archived from the original on 6 February 2018. Retrieved 6 February 2018. ^ H Hooli, Shekhar (29 August 2017). "Arjun Reddy US box office collection: Vijay's film beats Vivegam, A Gentleman in first weekend". International Business Times India. Archived from the original on 6 February 2018. Retrieved 6 February 2018. ^ H Hooli, Shekhar (28 August 2017). "Arjun Reddy 1st weekend box office collection: Vijay's film attains blockbuster status in just 3 days". International Business Times India. Archived from the original on 6 February 2018. Retrieved 6 February 2018. ^ H Hooli, Shekhar (30 August 2017). "Arjun Reddy day 5 box office collection: Vijay scores his 2nd $1 million grosser in US after Pelli Choopulu". International Business Times India. Archived from the original on 6 February 2018. Retrieved 6 February 2018. ^ H Hooli, Shekhar (1 September 2017). "Arjun Reddy 7-day box office collection: Vijay's movie crosses Rs 30 crore mark in first week". International Business Times India. Archived from the original on 6 February 2018. Retrieved 6 February 2018. ^ H Hooli, Shekhar (11 September 2017). "Arjun Reddy US box office collection: Vijay's film beats Gautamiputra Satakarni to be 4th highest Telugu grosser". International Business Times India. Archived from the original on 6 February 2018. Retrieved 6 February 2018. ^ H Hooli, Shekhar (12 September 2017). "Box office collection: Arjun Reddy emerges big winner; Paisa Vasool, Yuddham Sharanam, MMA flop". International Business Times India. Archived from the original on 6 February 2018. Retrieved 6 February 2018. ^ "Arjun Reddy: Women organisations protest against Vijay Deverakonda-starrer; demand ban". Firstpost. 2 September 2017. Archived from the original on 16 April 2018. Retrieved 13 April 2018. ^ Rangan, Baradwaj (1 September 2017). "Arjun Reddy Movie Review". Film Companion. Archived from the original on 28 January 2018. Retrieved 28 January 2018. ^ Shiva Kumar, S (31 August 2017). "It is a 'different' film". The Hindu. Archived from the original on 5 April 2018. Retrieved 5 April 2018. ^ "Arjun Reddy movie review: Intense, raw and unbelievably honest. 5 stars". Hindustan Times. Indo Asian News Service. 26 August 2017. Archived from the original on 26 January 2018. Retrieved 26 January 2018. ^ Srivatsan (30 August 2017). "Arjun Reddy movie review: Vijay Deverakonda's film deserves to be celebrated". India Today. Archived from the original on 26 January 2018. Retrieved 26 January 2018. ^ Kavirayani, Suresh (29 August 2017). "Arjun Reddy movie review: This film is a sensation!". Deccan Chronicle. Archived from the original on 31 January 2018. Retrieved 31 January 2018. ^ Kumar, Hemanth (25 August 2017). "Arjun Reddy movie review: Vijay Devarakonda-starrer heralds a new chapter in Telugu cinema". Firstpost. Archived from the original on 28 January 2018. Retrieved 28 January 2018. ^ Srinivasan, Latha (1 September 2017). "Arjun Reddy movie review: A sensational film that pushes all boundaries". NewsX. Archived from the original on 31 January 2018. Retrieved 31 January 2018. ^ Naresh Kumar, K. (27 August 2017). "Arjun Reddy: Bold, different and tad too long". The Hans India. Archived from the original on 31 January 2018. Retrieved 31 January 2018. ^ Murali Krishna, CH (26 August 2017). "Arjun Reddy: A youthful masterpiece". Cinema Express. Archived from the original on 3 February 2018. Retrieved 3 February 2018. ^ Rajendran, Sowmya (4 September 2017). "'Arjun Reddy' may be a 21st century epic but why are its women stuck in the past?". The News Minute. Archived from the original on 5 April 2018. Retrieved 5 April 2018. ^ Bhandaram, Vishnupriya (4 September 2017). "Arjun Reddy: How Vijay Devarakonda's film is a nod to toxic masculinity". Firstpost. Archived from the original on 5 April 2018. Retrieved 5 April 2018. ^ Hooli, Shekhar H. "Zee Telugu Golden Awards 2017 winners list and photos". International Business Times. India. Archived from the original on 8 June 2018. Retrieved 8 June 2018. ^ "Nominations for the 65th Jio Filmfare Awards (South) 2018". Filmfare. 4 June 2018. Archived from the original on 4 June 2018. Retrieved 4 June 2018. ^ "Winners of the 65th Jio Filmfare Awards (South) 2018". Filmfare. 16 June 2018. Archived from the original on 20 June 2018. Retrieved 20 June 2018. ^ "Arjun Reddy's Tamil remake now titled Adithya Varma, new poster out". Hindustan Times. 19 February 2019. Archived from the original on 19 February 2019. Retrieved 19 February 2019. ^ Lohana, Avinash (26 October 2018). "Shahid Kapoor's Hindi remake of Arjun Reddy titled Kabir Singh". Mumbai Mirror. Archived from the original on 26 October 2018. Retrieved 26 October 2018. ^ "Shahid Kapoor confirms Arjun Reddy remake, will play Vijay Deverakonda's role". Hindustan Times. 12 May 2018. Archived from the original on 16 May 2018. Retrieved 16 May 2018. ^ "Kiara Advani will star opposite Shahid Kapoor in 'Arjun Reddy' remake". The Times of India. 25 September 2018. Archived from the original on 25 September 2018. Retrieved 25 September 2018. ^ "'Arjun Reddy' remake goes on floors; an excited Kiara Advani wishes Shahid Kapoor and team luck". Daily News and Analysis. 22 October 2018. Archived from the original on 22 October 2018. Retrieved 22 October 2018. ^ "Arjun Reddy Hindi remake, starring Shahid Kapoor in Vijay Devarakonda's role, to release on 21 June 2019". Firstpost. 31 July 2018. Archived from the original on 2 August 2018. Retrieved 2 August 2018.